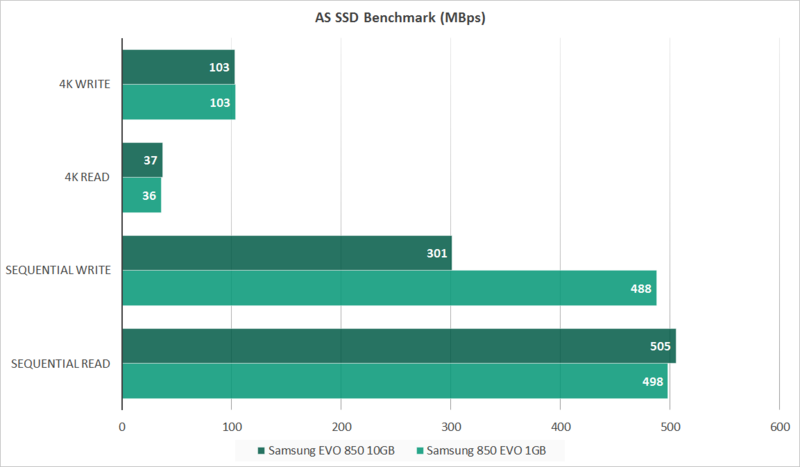 Over the last few years, SSDs have gained a reputation as a universal kick in the pants for system performance, providing super-fast random access times and three times or more the sustained write speed of a hard drive. The latter makes dealing with large files and backups far less tedious. 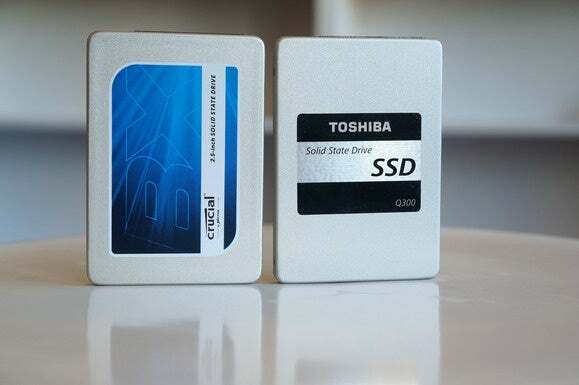 But that assumes that the SSD uses SLC (single-level cell/one-bit) or more commonly, MLC (multi-level cell/two-bit) NAND, and not the relatively new kid on the block, triple-level cell or TLC NAND. TLC can store three bits per cell for greater data density and more capacious SSDs in the same form factor, but its sustained write performance is comparatively poor—in some cases exceedingly. To overcome TLC’s slothful write performance, vendors use a healthy dose of SLC—or TLC treated as SLC in Samsung’s case as it’s the writing three bits that’s slow—and possibly some DRAM as a far faster cache. As long as the amount of data being written to the drive fits in the cache, all is well, and you’ll get the performance vendors claim. But the second the data overflows the cache, you’re writing directly to the TLC, and performance suffers accordingly. 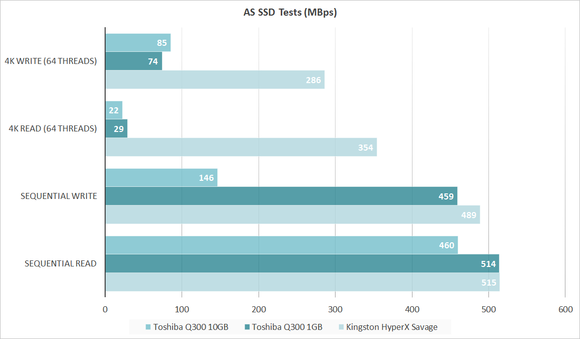 In some cases, such as with Samsung’s 840 (depending on capacity) and 850 EVO, the drops are comparatively mild—from 400MBps to 300MBps in our 20GB copy tests. In other cases the drop is astonishing (and painful). As you can see below, the Crucial BX200’s sequential write performance skids from 400MBps to 80MBps when the cache is overwhelmed. Gulp. Performance hits the skids when the amount of data exceeds the size of the Crucial BX200’s cache. 6GB for the 480GB model and 12GB for the 960GB models. Additionally, smaller capacity drives sport smaller caches and you’re writing to the TLC that much sooner. In the BX200’s case, the 960GB model has a 12GB cache, the 480GB model has 6GB, and the 240GB model only 3GB. As you can see above, performance tanks right on cue at the 6GB mark for the 480GB BX200 and the 12GB mark for the 960GB BX200. The same holds true for all TLC drives. TLC first showed up a couple of years ago in Samsung’s 840 EVO SSD. Samsung was honest about the performance issue, even if it didn’t advertise it very much. Below is their own chart of performance when writing to the cache (TurboWrite) and when writing to the TLC. You can see the difference that the TurboWrite cache made in the Samsung 840 EVO’s performance. A small dollop of DRAM didn’t hurt either. 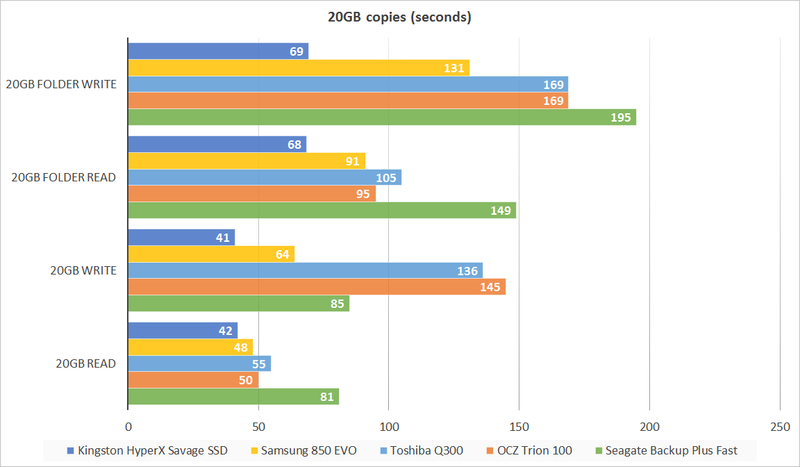 Below are the AS SSD 1GB and 10GB benchmark results for the newer 850 EVO (256GB) with its V-NAND TLC. OK, that’s a relatively mild, livable drop-off in sequential write performance. That’s why it wasn’t particularly big news at the time. That, and the 850 EVO’s then-low ball pricing. Now look at the test featuring Toshiba’s new Q300 (not the Q300 Pro) and its single-layer TLC NAND. Sustained write performance with a 1GB data set is 459MBps, but with a 10GB data set—146MBps. OK, that’s better than the BX200, but the drop-off occurs earlier and you’re still writing only as fast as a hard drive, albeit a top-notch one. Below you can see just how much faster an MLC drive (the Kingston HyperX Savage) is compared to any TLC drive when writing large amounts of data. Check out the 20GB write speeds. The 960GB version of the Toshiba Q300 was actually beaten, and handily, by a dual-hard drive, RAID 0 external USB 3.0 drive. Our 20GB copy tests illustrate the TLC write slowdown. A relatively mild drop-off with the 850 EVO but a severe one with the other drives. The green bars represent an external USB 3.0 RAID 0 drive to show just how slow things can get. (shorter bars are better). Now that you know about TLC’s sustained write performance drop-off, let’s visit the relevant conundrum: Pain versus gain. As read performance and the larger percentage of write operations are SSD-worthy, how often will the sustained write issue affect you, and how much money can you save by putting up with it? In the case of Samsung’s TLC drives, excepting the 120GB and 240GB versions of 840 EVO, performance is quite livable, even when directly writing to the TLC. The pricing is pretty decent as well at the moment, though there are cheaper MLC drives with better sustained write performance readily available. For the OCZ Trion (made by Toshiba), the Toshiba Q300, the Crucial BX200, and most likely any other single-layer TLC NAND SSD, those are much tougher questions.Only you know how much you’ll be writing to the drive. You should be fine during most day-to-day operations and light computing tasks. But performance plummets when copy games or movies to the drive, install the OS, back up to it, etc. Price is the real kicker. To date, unless you’re trying to make every penny count, there’s simply not enough in the way of savings to justify even the occasional aggravation. The 960GB BX200 costs $300, but the company’s own MLC-based MX200 SSDD costs only $20 more. That said, the SSD market seems to be entering a state of flux, and single-layer TLC SSDs may drop dramatically in price.—perhaps well below what MLC SSDs can reasonably be sold for. But until that happens, you’re better off with a low-end MLC-based drive.